Fancy a smoky BBQ fajita dinner? 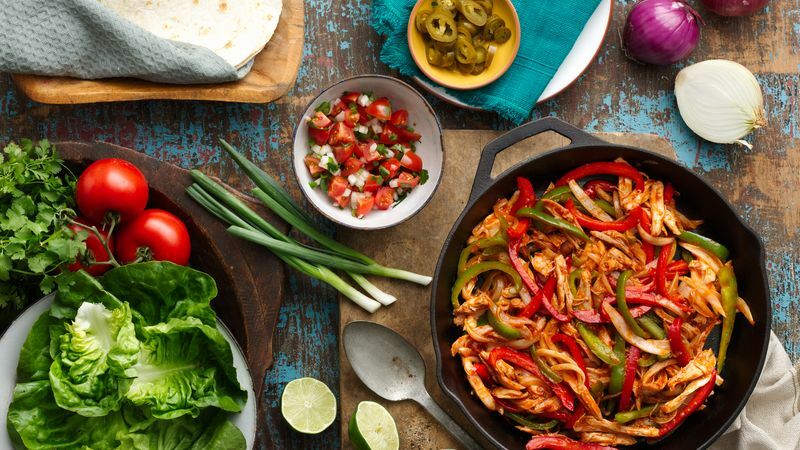 Try out this fajita recipe made with Old El Paso Fajita Kit with or without meat. Add the sliced peppers and onion to a bowl. Toss with the fajita seasoning. Next, put some oil into a frying pan and heat on medium. When the pan is hot, fry the peppers and onion until soft but tender. If using meat put some oil into a frying pan and heat on medium. Chop up the meat and fry, until browned. Next, slice the peppers and onion. In a bowl toss the veg with the fajita seasoning. Add the veggies to the meat and cook on medium heat until the veg is soft but tender and the meat is fully cooked. Time to assemble the fajitas: get one tortilla, add a blob of the salsa in the center. Add the meat if using. Add pepper and onion mixture on top. Spoon on the plain yogurt and scatter some grated cheese. Fold up and enjoy! Most importantly, make sure the food is piping hot before eating. *Leftover veggie or meat mixture can be frozen on the day but make sure it is fully cooled beforehand *.